Rare Aluminum Pilot house, Three cabins, Great cruising equipment, MUST GO! Make an offer before she Sells! World Class Blue Water Cruising Vessel price just slashed! Owner is interested in offers. MISTRESS V is a well equipped cruising vessel with three spacious staterooms, a comfortable salon/dining area with spectacular 360 degree visibility from her warm dry Pilothouse. She can easily accommodate 6 guests in comfort with her unique deck and cockpit layout. 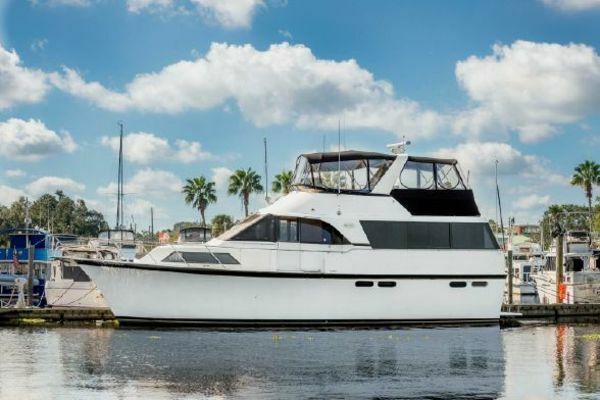 She is perfect for coastal cruising or exploring oceans and equipped to do both. She has efficient wind and solar systems, large capacity tankage and all the comforts of home including Air conditioning, 8kw generator, and deep freezer. Cruise in comfort and confidence with fuel capacity to cruise under power for 9 days and 1000 + miles, and plenty of water capacity. Her pilothouse offers the comfort of dry warm sailing during those challenging offshore passages. NOW BELOW $200K, MAKE AN OFFER BEFORE SHE SELLS! The pilothouse/raised salon is accessed directly from the cockpit bridge deck. Three steps down from the cockpit brings you to the bright pilothouse with its excellent visibility and 360 degree views. A settee, club chairs and cocktail table are to port, the steering and nav. station are to starboard. Plenty of storage is found here. A few steps down and aft of the pilothouse is a generous air conditioned owner’s suite with centerline queen berth and en-suite head to starboard with a separate stall shower to port. The size of the private aft cabin is similar to what one would expect in a center cockpit design with the benefit of a much more comfortable aft cockpit. Forward of the pilothouse/raised salon and down a few steps is the U shaped offshore galley to port with dining/lounge settee opposite. This area benefits from the natural light of the forward pilothouse windows. Two forward air conditioned guest cabins, one with with full-length upper and lower berths, one a V berth, have hanging lockers and shelves, and share a head. A lazarette and forepeak provide excellent storage space. Mistress V is one of the few aft cockpit pilothouse sailing yacht designs that really works at 51’. Dieter Empacher created a special offshore cruising yacht that has a true pilothouse which gives a proper inside steering station and a comfortable lounging/dining area. Dieter Empacher was chief designer of Little Harbor Yacht Design. His Kanter designs, like his work for Ted Hood, offer excellent sailing performance with a displacement hull that is comfortable and dry. Kanter is one of North America’s most experienced metal boat builders.